Martin and I have this weird penchant for vacationing in cold destinations during inevitably inclement times of year. Winter break in the Pacific Northwest is a prime example, and this past week, we took some time off to journey to New Hampshire and Boston. Luckily, a (relatively) early spring had come to the East Coast just in time for Martin’s cousin’s wedding and for our subsequent adventure eating our way through Boston’s North End (more on that later). And so we were off! 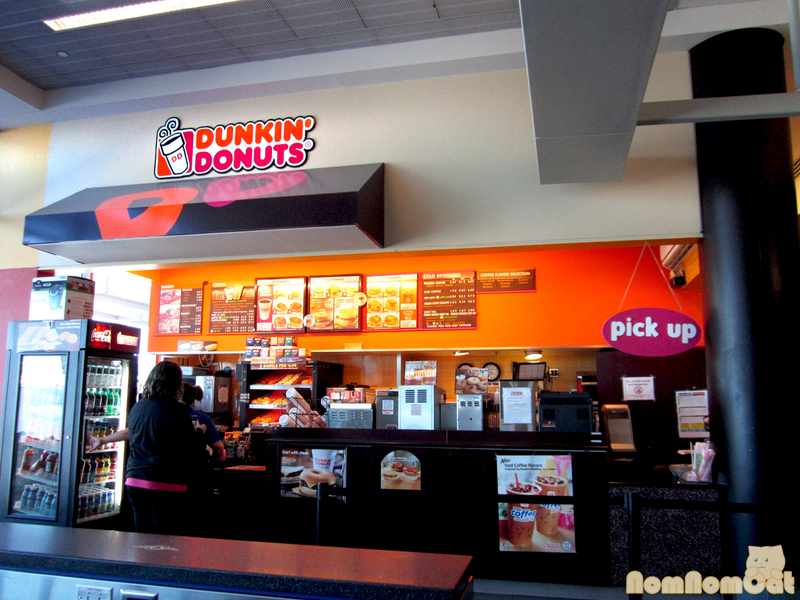 Sleepy and exhausted, our eyes immediately lit up when we were greeted with our very first Dunkin’ Donuts sighting right in the middle of Manchester airport. Sure, there’s TONS of them on the East Coast – practically one on every block. 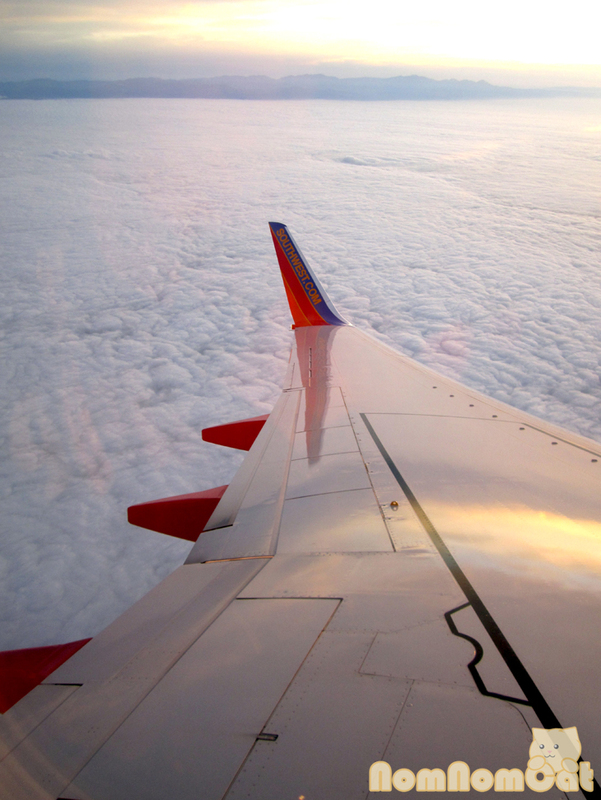 But for us, the only location is locked away in Camp Pendleton… for now. After a quick detour, we were off to the Steele Hill Resort, the site of the wedding ceremony and our home for the next few days. Thawing snow lay icy on the side of the winding road up to the resort, and the view of the Lakes was spectacular. 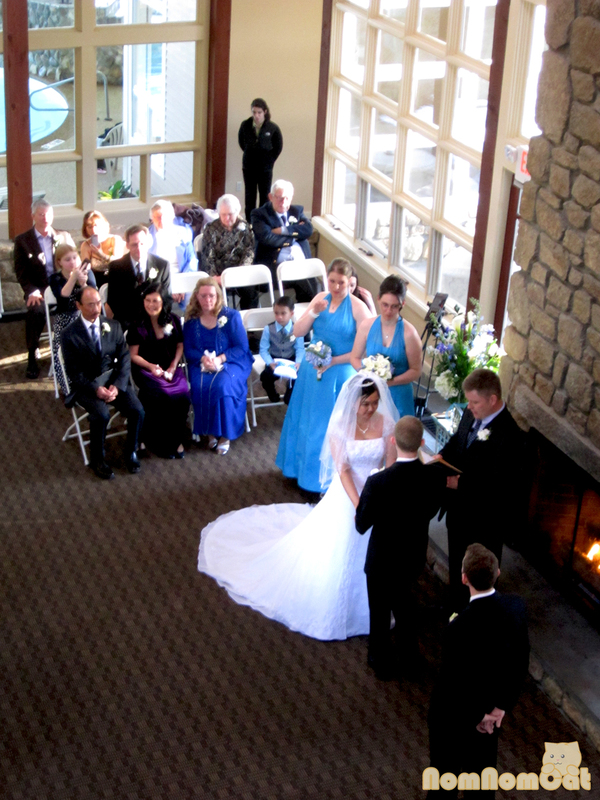 We could see why people choose it for weddings – the view and the food! 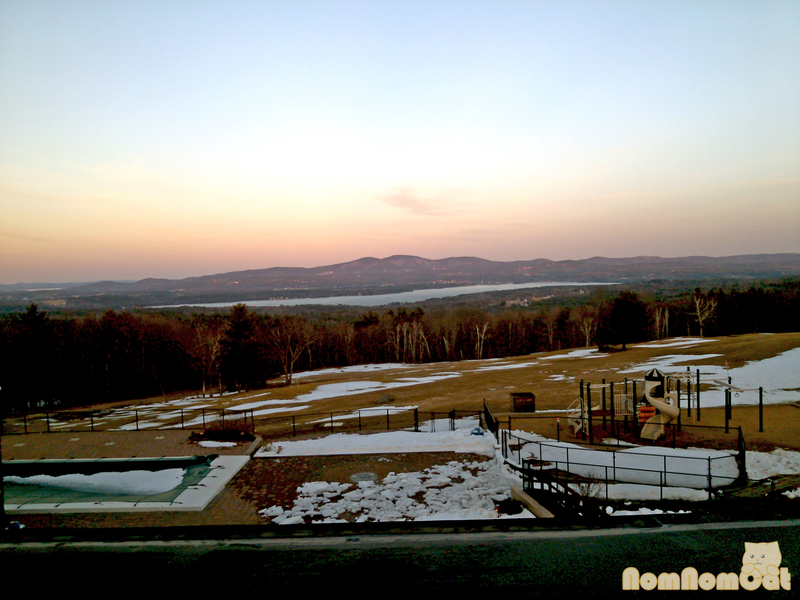 Our first meal in NH was dinner at the resort’s Hilltop Restaurant. Friendly service (who turned out to be familiar faces throughout our stay), delicious food, well-stocked bar and cocktail list, we were pretty pleased with our meal. 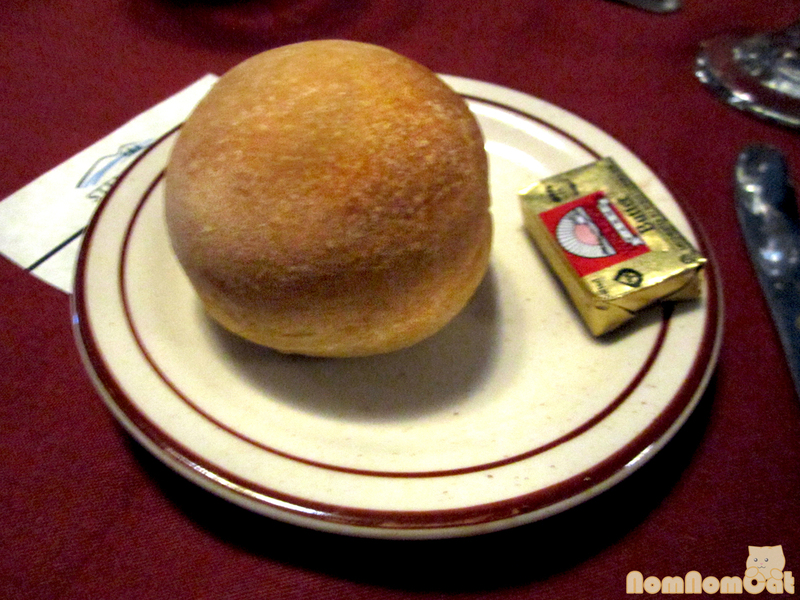 They also warmed their dinner rolls – a nice touch! The two appetizers our group ordered — the mozzarella sticks and the butternut squash ravioli — were completely inhaled before I could snap a photo. The mozzarella sticks were crunchy and oh so satisfying. The ravioli were al dente, although the maple cream sauce was a bit too sweet for me as I am partial to browned butter and sage. Thursday night is Lobster Night so of course I had to order the day’s special — lobster pie. 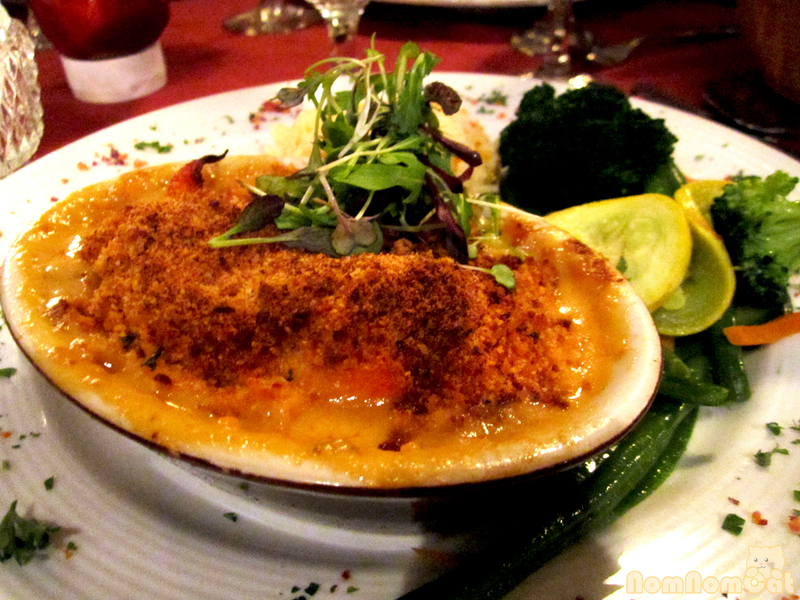 A gratin dish generously filled with succulent chunks of lobster meat swimming in a savory cream sauce and topped with a cracker crumb crust… I was in heaven. The lobster meat was moist and sweet, a great welcome to New England. The sauce drew its flavor from a seafood stock base, and I dipped everything in it – the side of steamed vegetables, the wild rice pilaf, even the sweet potato fries! Martin had the Hilltop Crab Cakes, crispy seared mounds so full of flaky, sweet crab that there was barely enough binding ingredients to hold them together. 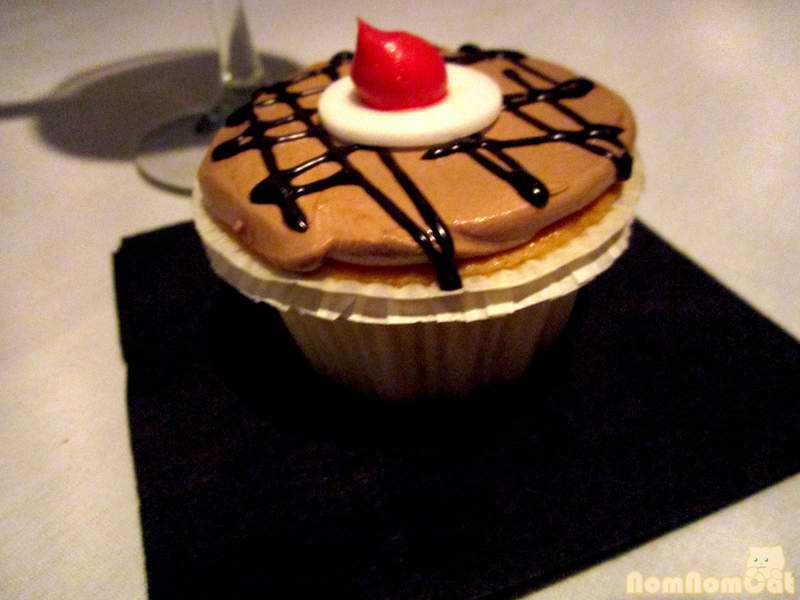 A good sign, for sure – he was ravenous and asked to devour them sans photo. 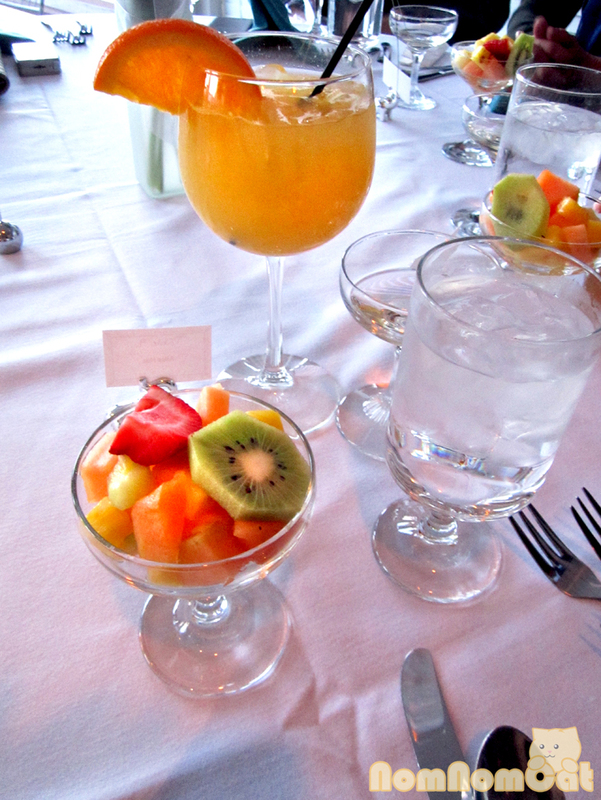 A glimpse at the tropics, the palate cleanser of fresh fruit accompanied by my peach schnapps mimosa is missing only a cute little drink umbrella to complete the picture. 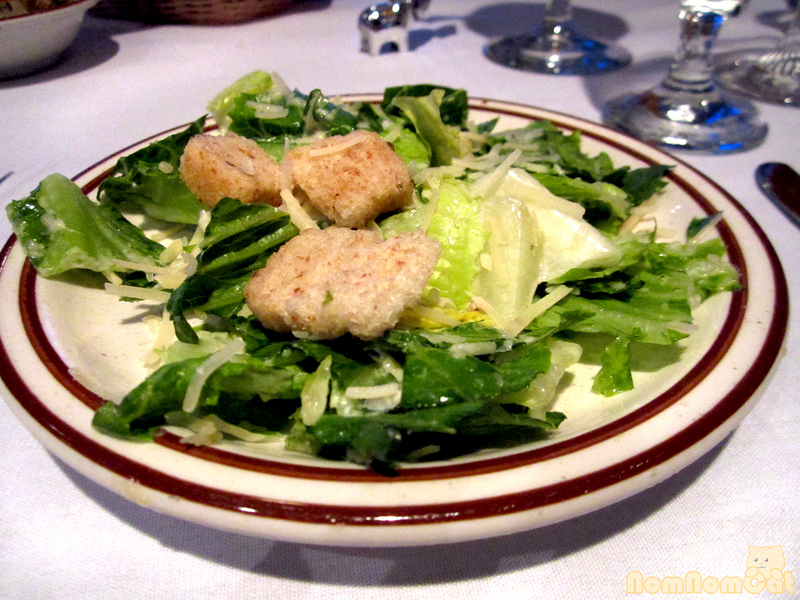 Classic caesar salad, flavorful albeit a tad overdressed. We were impressed by the gorgeous sear they were able to achieve on those steaks. 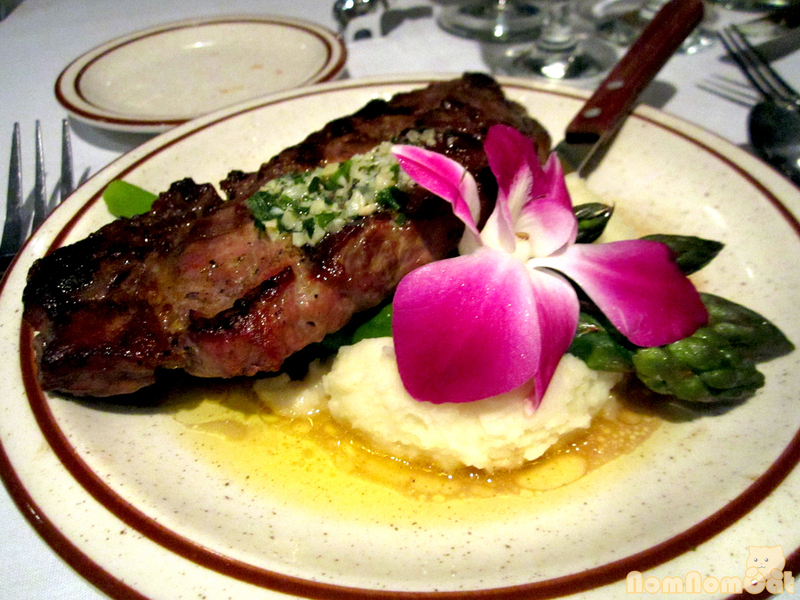 The portion was generous and though we both prefer our steaks rare, the beef was tender and juicy. 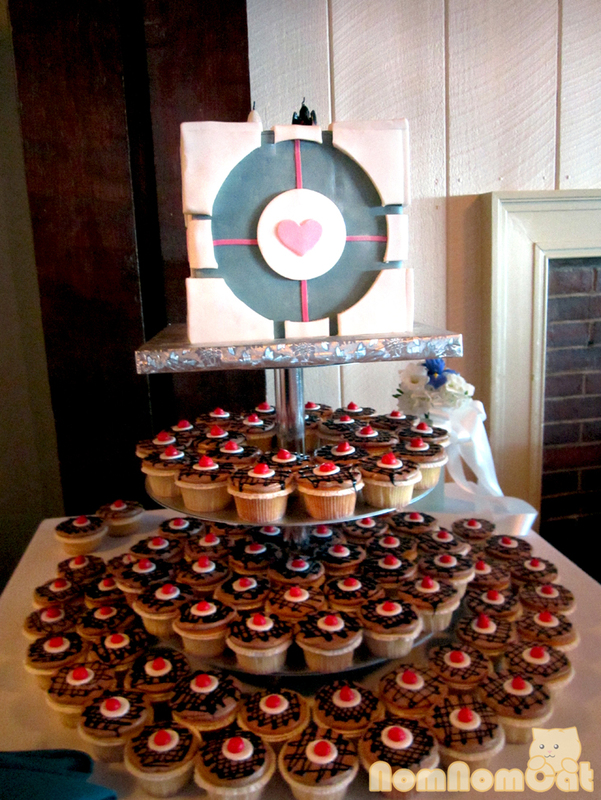 The bride and groom are awesomely nerdy, so their wedding cake was Companion Cube and the cupcakes were decorated to resemble the infamous cake (as in, “The cake is a lie!”). 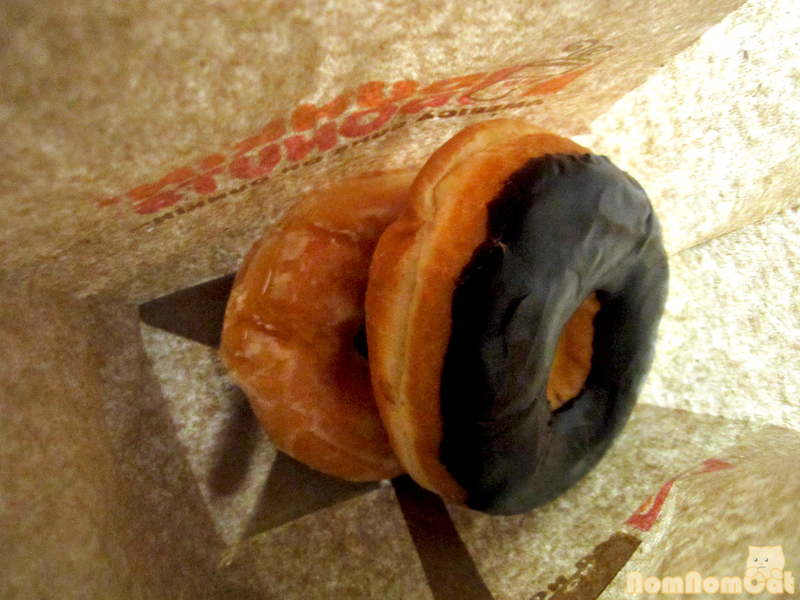 Seriously, all we were missing was a pair of giant blue and orange ovals. 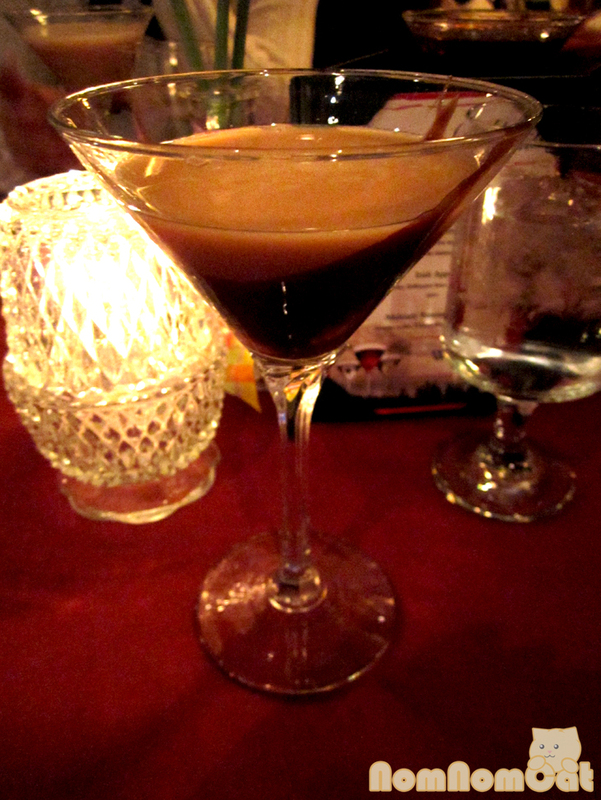 The weekend brunch at the Hilltop Restaurant is pretty good if you know what to look for. We were advised that the scrambled eggs could be rubbery, so we avoided those and doubled up on the lobster mac & cheese. Described on the menu as cavatappi pasta tossed with fresh Maine lobster & a perfect blend of 5 different cheeses finished with seasoned breadcrumbs, I had been dying to partake and ended up having two helpings. It’s okay. I balanced the stick-to-your-ribs comfort with some healthier selections, including the caprese salad. 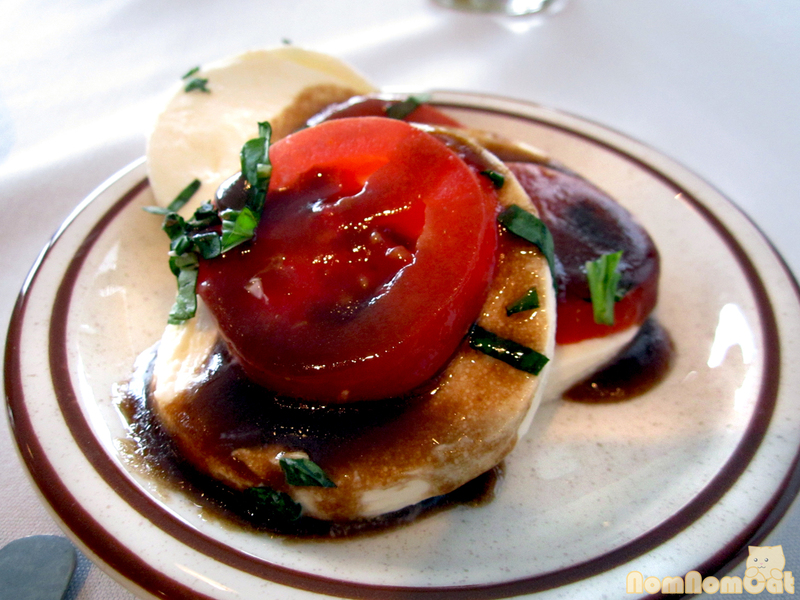 I love the combination of fresh creamy mozzarella, ripe sweet tomatoes, bright green chiffonade of basil, and a drizzle of vinaigrette, heavy on the balsamic vinegar. Yum! If you’re on the East Coast and looking for a relaxing weekend getaway, the Steele Hill Resort just might be the right place for you. Be sure to check their website for packages and other booking specials – we scored 25% off our stay and a movie night bucket filled with boxed candy, microwave popcorn (for the in-suite kitchenette), and a 2-liter bottle of soda. Sweet! P.S. 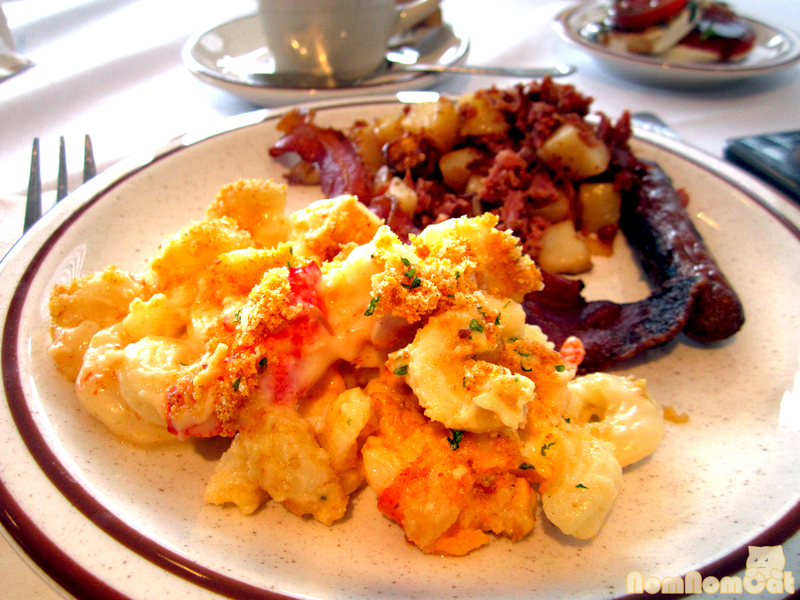 : Please order the lobster mac & cheese so I can nom vicariously through you.